Who Is Lgb Vision ? Lgb Vision is a professional window cleaning company providing a regular and reliable service to many satisfied customers in Bedfordshire and beyond. Our core work is window cleaning but with the addition of the water fed pole system to our company it has seen our services we offer massively increase. We can be seen in many villages and towns cleaning more than just windows. Conservatoires, gutters and hard surfaces are all cleaned using modern technology. We value your time so we have designed this website to be packed full of information and your go to website for any new cleaning or cleaning projects. A family run company established in 2001. We use a dedicated professional window cleaning planner to plan our work. Modern technology has been implemented where possible to give the customer and cleaner the best possible experience. 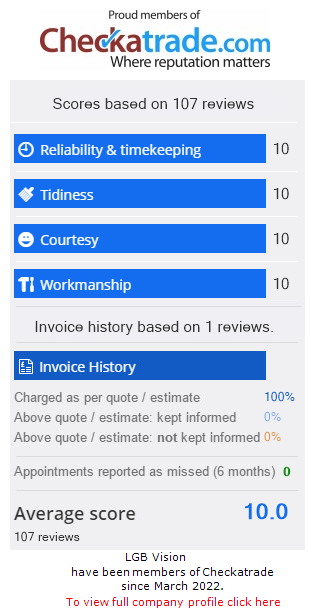 We value our customers and really do try to give a 110%. Our business model is very different from probably 99% of other window cleaning companies. Everyone who works under the Lgb Vision Brand wants to clean windows, we have to say brand as that's what been created. With our clever logo design and large customer base clients always make comments like "You seem to be everywhere, is there anywhere you don't cover"
Not Here Today, Gone Tomorrow ! In 2012 we decided as a company to "get online" as up until this point we had organically grown (Word of mouth). The year 2014 saw a refresh of our website which was already industry leading and now in 2016/2017 another refresh has seen us leave the competition for dust. Who knew window cleaning would ever be this so far advanced and is now considered a career option. The reason for all these changes was to further future proof the foundations we have worked so hard to create for Lgb Vision. Instead Of Trying To Predict The Future, Lets Create It ! We can be found on most social media platforms and even checkatrade.com where you will find we have one of the highest CAT scores in your area. Our goal is to provide an unbeatable service first and then a cost effective price second. Gone are the days of unanswered emails and text replies days later. Customers, clients and the world in general expect answers today, not tomorrow. So Whether you have a one bedroom flat or a six story commercial building we're the company to contact. Please take a look round our site and have a read through our news pages. We're always happy to help and advise. If you need any assistance with your project or cleaning then please contact us via email, phone, twitter or even facebook. Our preferred method of contact is via our easy to fill out contact form. 73.6% OF ALL STATISTICS ARE MADE UP, WELL THESE ARE NOT! Here at Lgb Vision we like to always offer the customer the easiest way to have their windows cleaned. Payments have always been an issue as it either relied on the cleaner to call back or the customer to send a cheque. Thankfully technology has improved and we have implemented this into our business. 61% of our payments are now classed as digital. Customers and clients contacting us through our easy to use contact form have no fear of waiting days for a reply. Our record for last year was a reply to an email in 43 seconds! We aim to answer emails with 24 hours and our current rate of reply is 86% of customers receive a reply within the hour. The water fed pole system has revolutionised the window cleaning industry. Windows naturally stay cleaner longer and with this we feel there is no need for windows to be cleaned on a regimental basis. All of our frequencies are between two figures, our most popular frequency is between 5 to 6 weeks. So far in 2017 we have been on time 99% of the time. We think everyone has heard the saying "You only get one chance to make a first impression". Dirty windows should not be the first impression of your company. We work with our clients to provide a personal and professional service. 2017 sees us achieving a 100% success rate on cleaning on time. We class being late as AM vs PM appointment!